The Curse of the Bambino brought to life. Here, in the flesh, the stroke of the pens that changed the game of baseball, the world of sports, and our world, simultaneously. 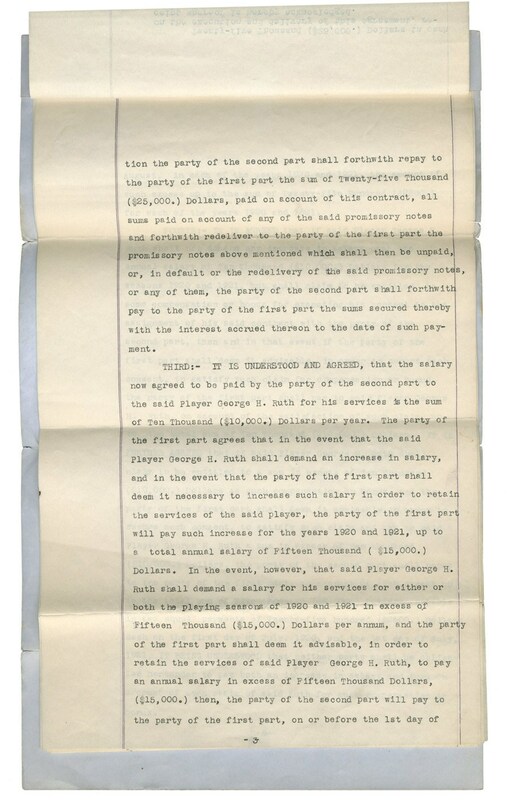 This is the contract that sealed the deal between the Boston Red Sox and the New York Yankees to bring Babe Ruth to New York and into the limelight, to make New York the center of the game to this day, create Yankee Stadium “The House That Ruth Built,” create the home run as the money standard of the game, and turn sports into the mega-culture it is today. 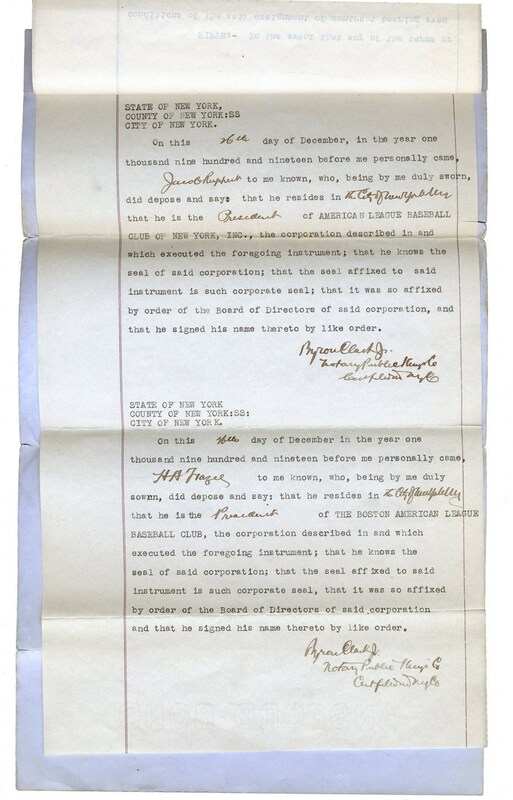 There are two authentic specimens known of this contract, both emanating from the collection of Barry Halper, the most important collector in baseball memorabilia history. Previously sold was the Boston Red Sox copy of the deal, formerly owned by the family of Harry Frazee, who allegedly sold the Babe to finance his theatrical productions. (The legend that he used it to finance the show No No Nanette is purely urban myth.) That copy was originally sold in a Leland's auction in 1993 to philanthropist Alan Shawn Feinstein. He later sold it at auction at Sotheby’s in 2004 for $996,000. 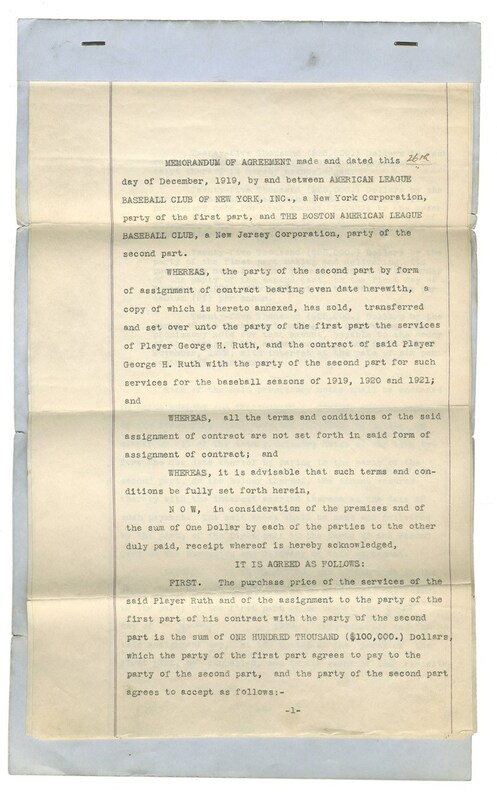 We present here the Jacob Ruppert copy (iconic New York Yankees owner) which Halper purchased from the Jacob Ruppert estate. It was sold privately by Leland's approximately a week after the “Frazee Copy.” It has remained in that collection ever since and has never changed hands since. The third and final “American League” copy has never surfaced. But we hope to someday offer it and go a perfect 3-for-3 and make the Babe proud in absentia. 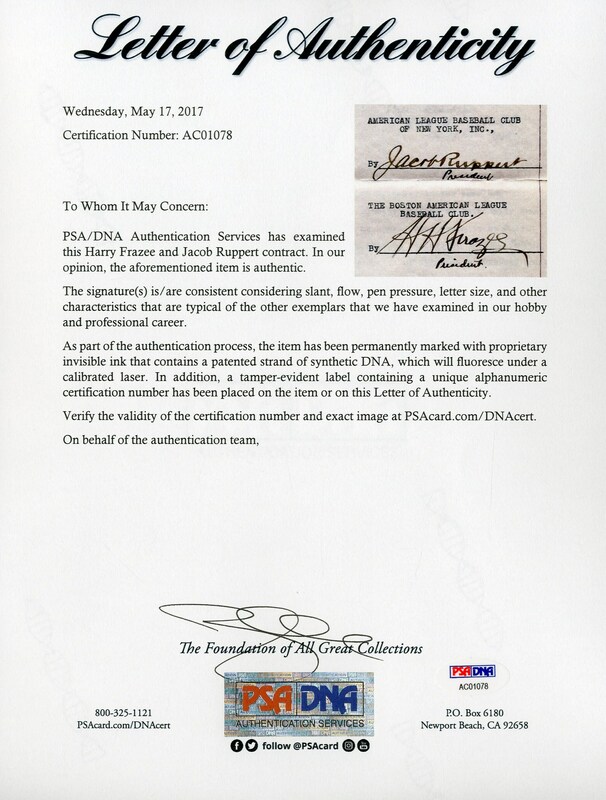 Six-page document with handwritten notes throughout is housed in a typical blue legal jacket of the period. 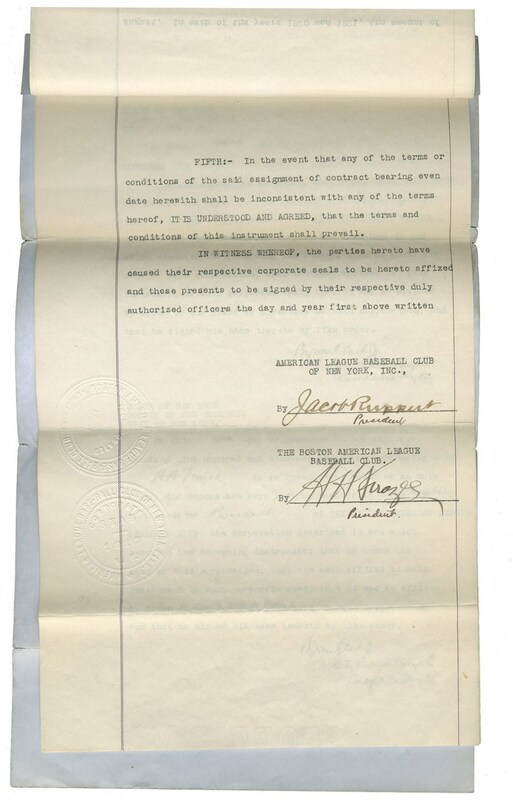 We believe the notes were all made by Byron Clarke, listed as the “Notary.” The cover reads the chilling words, “American League Baseball Club of New York Incorporated - And – The Boston American League Baseball Club AGREEMENT…” At the top is hastily scrawled simply “Ruth.” Agreement was made on the “26th Day of December 1919.” Contract is for the sale and transfer of the services of Babe Ruth from the Boston Red Sox to the New York Yankees for the sale price of $100,000. The greatest bargain in sports history (‘nuff said) in those simple words. Agreed to and signed by their respective team owners “Jacob Ruppert” and “H.H. Frazee” both in fountain pen ink. The word “President” has been written under both names in the hand of Byron Clarke who also acted as notary and we believe also made many of the handwritten notes throughout the contract. 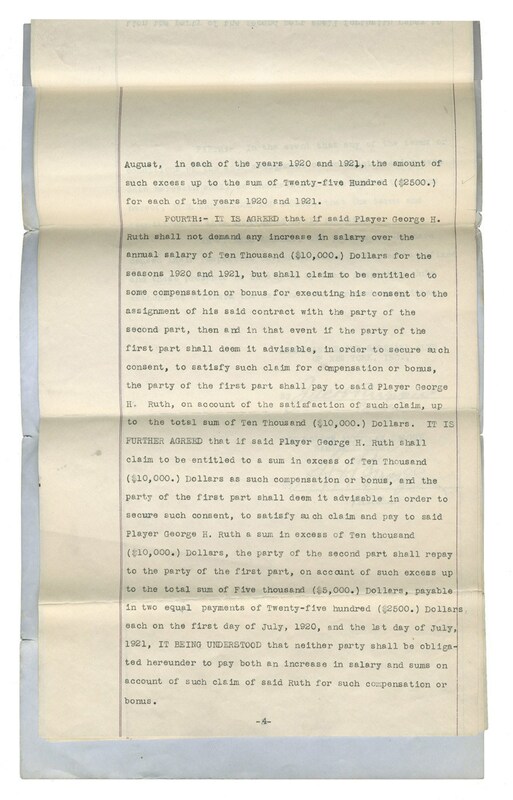 Interestingly the $300,000 loan is not mentioned, although the other documents that Halper owned from this collection included promissory notes that added up to the $300,000 loan, which was the key to the agreement for Red Sox owner Harry Frazee. Plaudits are not necessary here. This is simply for baseball and sports, akin to some of the great documents in the history of our country. The Declaration of Independence, Lincoln’s Draft of the Gettysburg Address or Albert Einstein “Theory of Relativity” Papers. These are both pieces and are in museums and institutions, never to see the light of day. But, these days pieces related to sports are cherished in a way as pieces that relate to the history of our country, our world. Some would say that that is blasphemy. But with uproar comes truth. 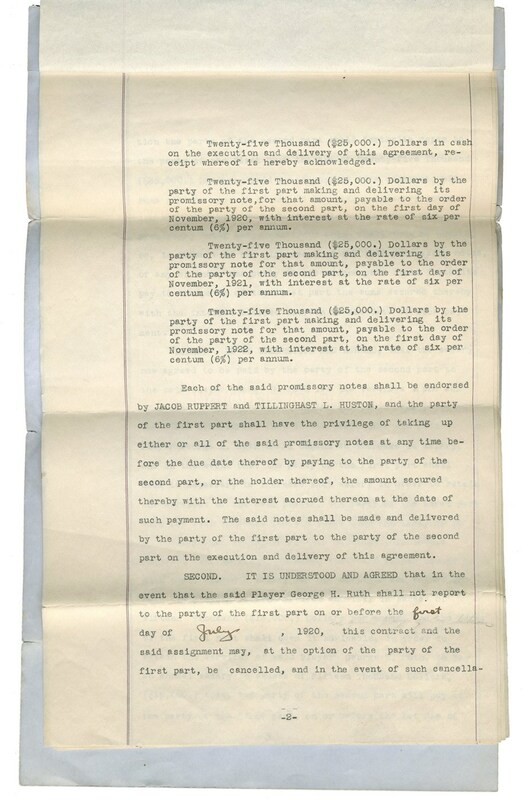 To many of us, a document such as this is as important as those historical documents. And to some even more so. The question we pose is what will happen if the market translates this theory, this preference, into reality? Then a piece such as this, this being the potentially ultimate proof of that theory, will be worth many times previous values. We shall see. The most important document in sports history. Comes with PSA LOA.